Thomas Hirsch flies helicopters in the Boston area. 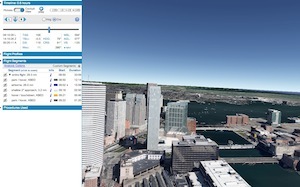 The first link has a city tour of Boston and should be seen in cockpit view, with the Buildings checkbox checked. The second line is a BFR with a pinnacle landing on a small helipad in a parking lot.